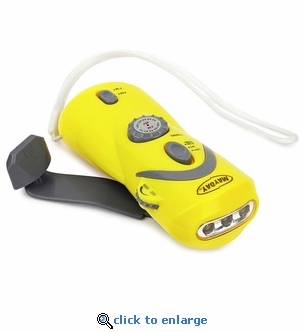 This dynamo hand crank emergency radio has a built-in 3-LED flashlight with on and blinking function, cell phone charger and siren. Never needs batteries, just wind the crank to charge. Being able to charge your cell phone during a power outage can be a life saver. This small emergency radio is perfect for home and auto emergency kits and camping. USB cable to charge cell phones.